Best of 2018: Movies, Music and Games! It’s been an awesome 2018 and in the next few weeks, I’ll be going through my top faves this year, from games to burgers to highlights of my cHEwY journey. Let’s kick it off with entertainment hey? Avengers: Infinity War: Not a perfect film, but a great cinema popcorn blockbuster. It was great seeing all the crossovers. 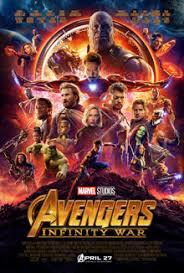 The biggest troll isn’t Thanos himself, but the directors who said that this was a standalone movie, not split up into 2 parts. So I kept expecting to see the Avengers actually beat Thanos…but SPOILERS it didn’t happen. A decade of Marvel films all came to this and it was glorious. Hey DC, this is how you build an universe, it takes time! Three Billboards Outside Ebbing Missouri: There’s a fineline between tradegy and comedy and this movie straddles this line throughout. Plenty of unlikable characters but they’re real and rooted within their reasons. There’s also some great laugh-out-loud scenes. Ready Player One: I loved the book back in my uni days and to see it come alive on the big screen was everything I thought it would be, thanks to it’s self-awareness and of course Spielberg cramming in as many in-jokes, references and easter eggs as he could. Kamikaze by Eminem: What happens when rappers are past their prime? Should there be an ‘adult contemporary’ hip-hop category? Eminem addresses this as he tackles the modern rap scene, defending his legacy, fighting to stay relevant. Yes, it speaks truer for die-hard fans like me, but it’s good to see Em isn’t going down without a fight. Daytona by Pusha T: Speaking of all-time fave rappers, Kanye West is back! Well…as a producer. He’s just as talented as a beat-maker as a rapper, and his production behind Pusha T’s latest album is slick. I’ve never been a big Pusha T fan, but he won me over here with some ice-cold BARS in a short 7 track LP (no fillers here). Nation of Two by Vance Joy: This will be a road trip staple, Joy’s sing-a-long folk songs go down easy and there’s so many gems here, including I’m going home and Saturday Sun. As a 35 year old gamer, I buy a lot but I don’t play a lot haha (the enemy of gaming is TIME haha). So my gaming habits these days revolve around chipping away my backlog (my shame pile) as well as playing a few new releases that I can’t ignore. Nintendo 3DS: I finally finished Pokemon Ultra Moon (love the Team Rainbow Rocket end game) and SNES classic, Chrono Trigger. At the moment, I’m halfway through Project X Zone 2. Xbox One: I must admit, I hardly bought any games for my poor black box this year, but I still love it. I dabbled in Fornite, but I used my Xbox to chip away at the Halo Master Chief collection. I have officially finished Halo 1-5. I also finally finished Life is Strange, grounded characters and a distinct soundtrack make this a classic. At the moment, I’m going through Forza 7, a driving game that soothes me haha.